Learn about affordable learning resources and open educational resources (OERs). If you'd like help locating library-licensed or open content to use in a class, please contact your department's library liaison. Using materials available through CofC Libraries can save your students money. The library offers e-books, databases, and journals that can be easily linked to and freely accessed through OAKS using the Build Reading Lists tool. In particular, the library has access to thousands of ebooks through the Springer and Knowledge Unlatched platforms, and many of these are appropriate for use as course textbooks. These ebooks are free from digital rights management (DRM), so they never expire once downloaded, and our license allows for unlimited concurrent use, so your students can all access the book at once. Other library ebooks can be used in your courses. Some have restrictions on concurrent use and may only be viewed by one or two users at a time. If you are interested in using a book with these restrictions, please contact the library. Our Collection Development department will work with you to see if those limits can be relaxed for your course. Includes scientific, technological, and medical books, including reference works, all with unlimited access and DRM-free. Ebooks from Knowledge Unlimited can be used and downloaded by an unlimited number of users, making them a good choice for class texts. The OAPEN Library includes all Knowledge Unlimited ebooks as well as many other freely available academic ebooks. Congratulations to these CofC instructors who have been recognized as PALs! Are you already utilizing course resources that are entirely free for your students? 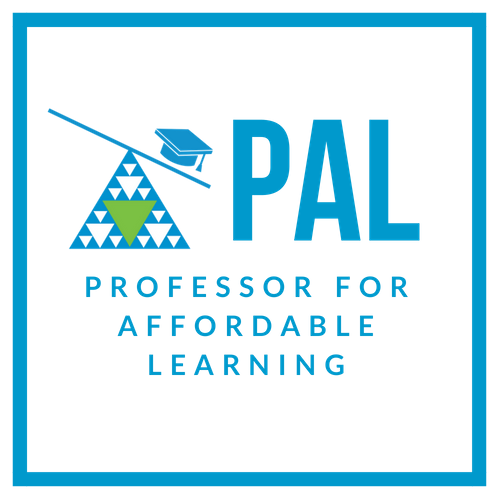 If so, apply to be recognized through PASCAL's statewide program, Professors for Affordable Learning! Open Educational Resources are educational materials offered freely and openly for anyone to use. Most licenses allow resources to be shared, remixed or customized for your class. Open educational resources include textbooks, full courses, course materials, modules, streaming videos, tests, software, and any other resources used to support access to knowledge. The General OER Collections and OERs by Subject pages have links to resources where you can find OER materials for your classes. Free Online Resources are resources that are available online but are not always open, so you may not be allowed to change or revise them to suit your needs. The Open Access Luminos collection from UC Press (below) is a good example. For those resources that do not fall under the public domain, it is best to use them by linking to the resource through OAKS and sending your students to the specific site and not re-posting the information. Open access scholarly books published by the School of Advanced Study, University of London. Each book is available as an open access PDF (full text) but can also be purchased in print (hardback and paperback) or as an ebook (EPUB format). Scholarly content made available through the website includes monographs, edited collections and shorter form works. Freely available academic books on topics in the social sciences and humanities.